There was shock, disbelief and tears of joy for the friends, family and supporters of critically ill prisoner Brendan Lillis on Thursday when news emerged that their campaign had succeeded in securing his freedom -- and a rare victory against state brutality in the North of Ireland. Confirmation that the crippled, bedridden prisoner had been released from his abuses at the hands of the British and Six-County authorities came when prison warders simply melted away from their guard post outside his hospital ward. Brendan had been under guard at Belfast City Hospital, having been moved there from the North’s notorious Maghaberry jail last week after a doctor working for the Irish United Nations Association insisted that he needed urgent treatment. The 59-year-old, who has interned by a British order two years ago despite suffering with a debilitating bone disease, was informed that he would be released with immediate effect. No reason was given for the decision by the Parole Commissioners, who, along with Six County Minister for Justice David Ford, had been subjected to a high-volume international human rights campaign on Brendan’s behalf. Speaking from his hospital bed, Brendan thanked his partner Roisin Lynch and all those who had campaigned assiduously for his release. “Roisin has moved mountains. Somebody who can do that on their own, well, I can’t say enough about her,” he said. Roisin also thanked all those who had supported the campaign. She said Brendan had been freed without conditions or stipulations, largely thanks to their efforts. “I had fought and fought but I really wasn’t expecting it,” she said. “The governor of Maghaberry rang me at 5.50pm and said the commissioners had decided Brendan should be let out with immediate effect. She said it “would have been insane” to keep him in custody. “I can’t thank people enough for their support. Brendan is out,but we have to fight on for other people who are being brutalised,” she said. She was referring to other internees and political prisoners who remain at Maghaberry, such as IRA veteran Marian Price, who was interned only last month. Roisin said she felt vindicated by the verdict. 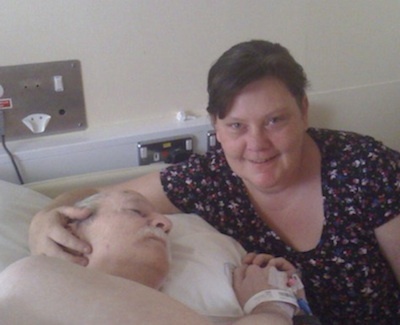 However, she said Brendan remains seriously ill and is likely to remain in hospital for some time to come. He suffers from the condition ankylosing spondylitis, which saw him confined to bed in Maghaberry’s medical unit for 18 months. His weight had decreased to under 80 pounds as a result of his life-threatening illness. Earlier on Thursday, the mood among campaigners was much different when it emerged the prison authorities had secretly placed spy cameras in Brendan’s hospital ward and toilet. Planning was already underway for a human-rights based legal action to remove the cameras, when the good news came through. With tears in her eyes and “in bits”, Roisin immediately rushed to the hospital. “I wanted to lift him out of hospital and bring him home; I can’t because he’s not well enough to come home,” she said. “We’ve just learned recently that we’re going to be grandparents again. There’s just so much that we’ve missed out on, but there’s so much that I’m going to be able to share with him. “You have to fight tooth and nail, and that’s what I’ve done for a long time. It’s over for Brendan but the fight is not over,” she added. She described the justice system as “very flawed” and said it was “the only logical, humane decision” the Parole Commission could have taken. She couldn’t understand why it had taken so long and required such a huge campaign effort. Last month, the commissioners refused Brendan’s release on compassionate grounds, while David Ford insisted that the matter was out of his hands. Roisin said the Justice Minister had attempted to dodge taking a position. “I think David Ford didn’t make the decision because he was relying on the Commissioners making the decision and then he wouldn’t get caught in the trap between DUP and Sinn Fein,” Ms Lynch added. In the end, the campaign to free Brendan Lillis was supported by a wide variety of political opinion, from the traditionalist republican groups to Sinn Fein and the moderate nationalist SDLP. West Belfast Sinn Fein MP Paul Maskey welcomed the decision to release Brendan and said compassion had been needed from the criminal justice system, given his medical condition. “Sinn Fein are absolutely opposed to the revocation of licenses - it is tantamount to internment and goes against natural justice,” he said. “From the start what this case required was compassion from the criminal justice system. It was obvious that Brendan Lillis posed no threat to society, he has been bed-ridden for almost two years. “Myself and colleagues have held numerous meetings with the prison administration and the Justice Minister David Ford in an attempt to secure Brendan Lillis release. SDLP Justice Committee member Colum Eastwood also welcomed the release. He said: “Fortunately common sense has prevailed and the parole commissioners have made the right decision to release Brendan Lillis. “This is a victory for justice. However, it is a such a shame that David Ford didn’t make this decision earlier when he had numerous opportunities to do so.